Several years ago I paid a visit to a dermatologist for the very first - and last - time. The visit didn't go very well, but I did manage to take with me one very valuable piece of advice from the nurse who took down my information prior to my meeting with the doctor. When she asked me what I washed my face with, and I replied, "Ivory, just like every woman in my family for decades," she just shook her head and reached into her pocket, drawing out a sample of Cetaphil Gentle Skin Cleanser. She handed it to me and instructed me to toss out my bar soap and never wash my face again with anything but Cetaphil. That was four years ago. I can't promise that I've stayed faithful to Cetaphil in the time since my visit to the dermatologist's office - I'm too finicky and I like to try new things - but I always, ALWAYS, go back, because it works. It leaves my skin feeling smooth and moisturized, but never greasy. And it removes all my makeup, including mascara and eyeliner, without scrubbing or irritation. There are two ways to use Cetaphil Gentle Skin Cleanser - with or without water. If you choose to use it with water, don't expect it to lather, because it contains no sulfates and won't bubble no matter how hard you rub. It has the consistency of a thin lotion, and rinses quickly and easily, leaving your skin feeling smooth and soft. You may not need moisturizer after using it - I rarely do. If you'd rather use Cetaphil without water, just rub a generous amount onto your face and neck and then remove the excess with a tissue. There's no need for rinsing. In fact, that's the most beautiful part about this product - a thin layer left on your skin is actually good for it. I always use the cleanser with water, but after patting my face dry, I pump a small amount into my hands and then massage it on my skin. It helps prevent breakouts and seals the skin against germs and other contaminants. Cetaphil Gentle Skin Cleanser can be used all over the body, and even on children and babies. It removes dirt and oil without drying or irritating even the most sensitive skin types. I will often apply a small amount to easily irritated or acne-prone areas of my body - like my shoulders or chest - to prevent and treat breakouts. Nothing works as consistently as Cetaphil at keeping my skin clear. 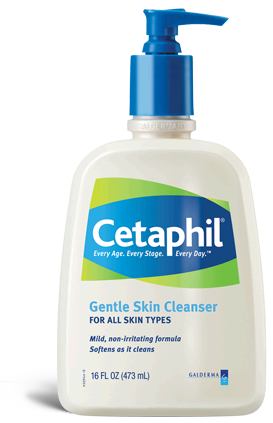 If your current facial cleanser is drying out your skin, or seems to contribute to breakouts instead of curing them, or if your skin is beginning to age and you'd like a cleanser that won't speed up the process, give Cetaphil a try. I can't recommend it enough, and I'm giving it 8 out of 8 Tentacles to prove my love. I am totally going to start using this version! I use the soap-free bar whenever I am doing a lactic acid peel and it does the job without drying out my skin. I'm definitely trying this one, after years of trying out everything and not having it work well. Maybe going back to the basics is just what my skin needs.